Oran Kearney revealed his latest signing to Coleraine on Monday night. The highly-rated midfielder Matthew Kirk (18) has joined the Bannsiders on a two-year deal and becomes the fourth summer arrival. The Northern Ireland schoolboy international has been on trial with the club for a number of weeks after being watched closely last season at Newbuildings United. “We threw him at the deep end last weekend against Bangor City to see how he would react and I thought he done fantastically well. “He performed well for Northern Ireland’s under 18 squad in the Centenary Shield and has been called-up to the under 19 squad. 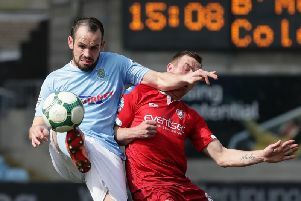 Kirk will compete with Ciaron Harkin, Brad Lyons and David Kee for a starting place in the Bannsiders’ midfield, and Kearney believes he has all the attributes to force his way into the side. “He plays a similar style of football to Ciaron Harkin and Brad Lyons and covers a lot of ground as well. “He is a couple of years younger than those two but has similar qualities and can develop even further. The Bannsiders boss also confirmed the ‘door is still open’ for new recruits but is happy with the squad at his disposal. “Until the transfer window closes the door is still open,” Kearney said. “We work tremendously hard bringing in the right players and we don’t sign anyone for the sake of it. “It is noted that we have a small squad, but it’s high in quality and we have no passengers.